The Alchemist’s Spell has a lot of things to recommend it, from the choice of theme, to the ways to win or the features, but the design is clearly not going to be one of them. It has a dated design, one that wouldn’t normally be associated with the ways to win which are employed inside. Playtech didn’t do it any favors when it created the graphics part, but at least the features look good, and they might be enough to get players to try it out. 243 paylines (ways to win) are used on the standard 5 reels of The Alchemist’s Spell. 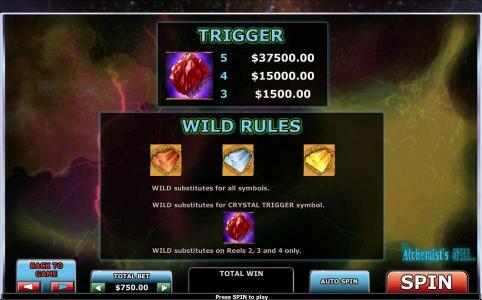 You’re also going to find on them three types of wilds, each one with a different multiplier, plus a scatter symbol which starts off the free spins. The biggest prize would be the one coming from the Alchemist, with a value of $125,000. 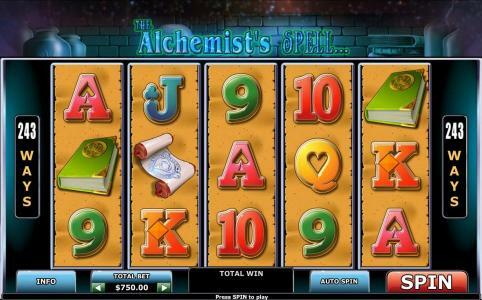 The major features in The Alchemist’s Spell are its ways to win, the wild symbols, multipliers, scatter symbols and its free spins. In a game with ways to win, the regular paylines are only used for the betting purposes, but the actual combinations are formed on adjacent reels, not in fixed positions that are predetermined. The 243 ways to win are basically paylines, covering every single possibility for a combo to form. Three wild symbols are used in the game, on the 2nd, 3rd and 4th reels. Each reel gets its own wild, with its own multiplier. First, we have the Bronze wild, on the 2nd reel, and applying a 2x multiplier to the wins it helps form. Next, there is the Silver Wild, with a 3rd reel appearance and with 3x multipliers. The third one is the Gold Wild, present on the 4th reel and with a 5x multiplier. Wild symbols can participate together to the creation of the same combinations, and it’s easier than ever since they’re on ways to win and not paylines. They also pool together their multipliers, so depending on which wilds are present, you can get anywhere between 2x and 30x the usual prize with their help. The Red Crystal would be the other type of symbol in the game, the scatter. It will pay its own prizes, up to 50 times the wager, and it does this by landing enough symbols on the reels (up to five). The other thing it offers is the free games feature. 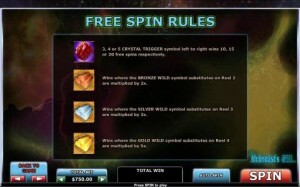 With 3, 4 or 5 Red Crystals, you will be offered 10, 15 or 20 spins for free, respectively. 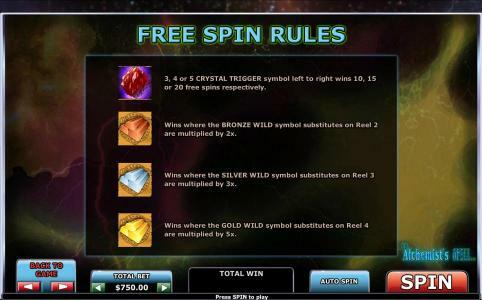 The requirement is for these symbols to appear from left to right, on adjacent reels, and that makes them as easy to use as regular symbols, since they all pay this way in a slot with ways to win. You don’t have to use 243 coins to activate the ways to win. 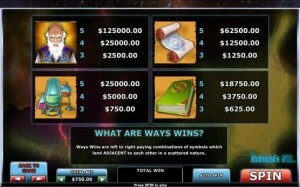 The game requires only about 30 coins and uses the same number of paylines for wagering purposes, to keep things simple. You basically work with the total value of the bet, taking it as high as $750 for one spin. The slot tells you the exact value of the prizes you can expect from each symbol. The Alchemist icon forms the best paying combos, offering up to $125,000 when the maximum bet of $750 is selected. By far, the design of the game is the weakest thing about it. The area you see at the top is from the alchemist’s lab, with jars and books placed on a table, in a dark room. The reels seem to be made out of paper, holding on them some alchemy related symbols and a bunch of standard poker cards. There is nothing to spark your imagination in this game. Symbols: Red Crystal (scatter, 50x bet), Bronze Bars (wild), Silver Bars (wild), Gold Bars (wild), Alchemist (5,000 coins), Scroll (2,500 coins), Alchemy Equipment (1,000 coins), Alchemy Book (750 coins), Ace (200 coins), King (150 coins), Queen (100 coins), Jack (100 coins), 10 (100 coins) and 9 (100 coins). 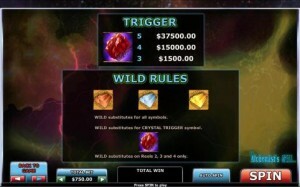 The slot has some good things to offer, meaning mostly the prizes and the huge multipliers coming from the wilds, but the design is clearly among the cons. You will find The Alchemist’s Spell at any online casino which chooses to use software from Playtech, playable either for free or for real money.